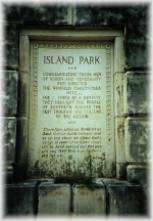 Commemorating those men of wisdom and generosity who directed the Winfield Chataqua here ...For a third of a century they brought the people of Southern Kansas the best thought and culture of the nation. "Therefore, when we build, let us think that we build forever; and as we lay stone on stone that a time is to come when those stones will be held sacred and that men will say, 'See! 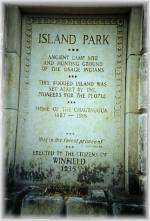 this our Fathers did for us',"
The site of the original Chautauquas in Winfield, today the park is used by families for picnics and recreation. 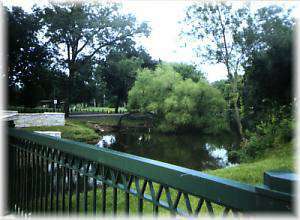 The park is at the North end of Main Street surrounded by the Timber Creek Lagoon.